Read Dawn Lee's interview with editor Mary McLaughlin Slechta here. I have enjoyed the Fire Island National Seashore Artist-in-Residence program first as a resident and now working with the NPS as coordinator of the program. It has been an extremely rewarding experience. "The Fire Island National Seashore Artist-in-Residence program honors the long standing tradition of art in the national parks and on Fire island by facilitating artist to create relevant place and story-based work that brings a broader understanding of the unique elements that comprise Fire Island. 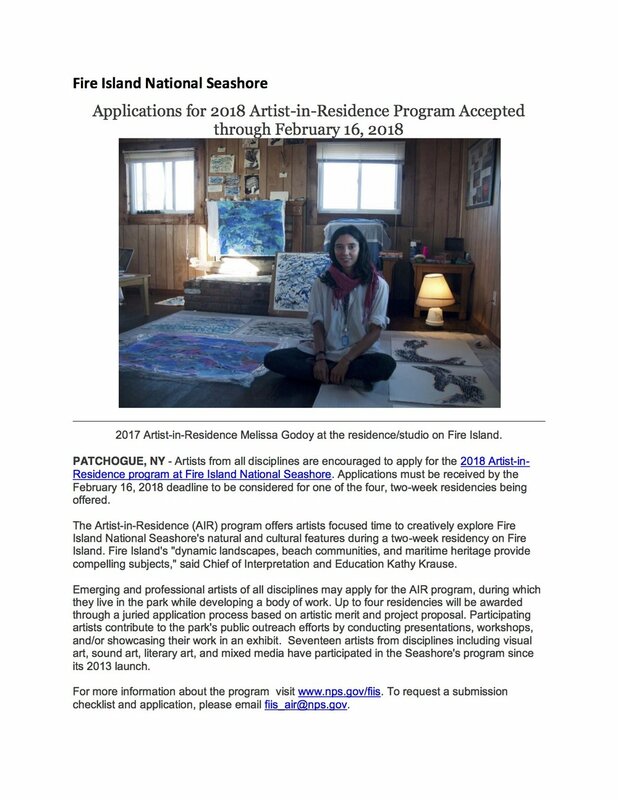 The goals of this program are to provide creative and educational opportunities for artists of all disciplines to explore the qualities of the natural environment, culture, and/or history of Fire Island, and to support the mission of the NPS to promote the conservation and preservation of the park."